One of Vietnam's ancient capital cities, Hoa Lu is best known for its enchanting tombs and ruins. Our first stop takes us to the temples of 2 kings, Dinh Bo Linh and Le Hoan. We will then proceed to Tam Coc wharf before we break for lunch. For the second part of this expedition, Trang An is nothing short of being unique exceptional. 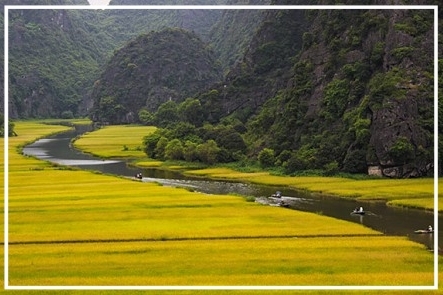 Made up of karst mountains and fantastic scenery near Ninh Binh, Trang An is popularly known as Halong Bay on land, a reputation further enhanced by its network of small rivers, caves, canals and lagoons. The highlight of this trip would be getting on a slow boat ride and navigating all these wondrous sights. We offer private tours - group will only include you, and your family & friends. Our customized tours are designed to your preferences and specific interests. Through our vast experience and network, we offer you a repertoire of activities and experiences that tourists have little access to. We will take you to places where you will enjoy local prices on food and shopping. Your hygiene and safety are of utmost importance to us. Special arrangements can be made for young children, seniors, or persons with special needs. Tour prices are all-inclusive. Any additional costs will be advised in advance. Halal certified options are also available for our Muslim friends.